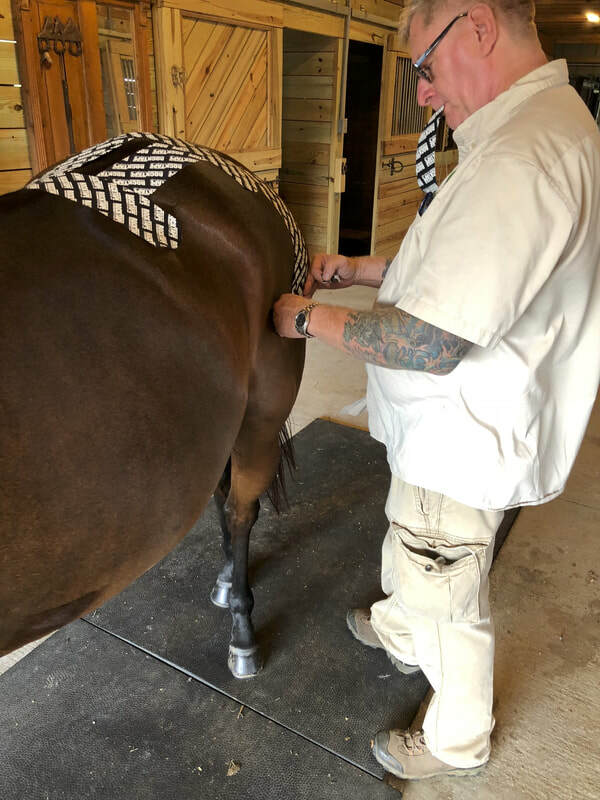 As a professional in the field of Bodywork regardless of whether it’s for the human side of the business or the equine I have pursued continuing my education, so I may provide the best service possible. Any modality I use whether it is Massage, Cranio-Sacral, Acupressure or Kinesiology Tapping I have experienced each modality as a client. Approximately 3 years ago I came down with a pretty intense case of Plantar Fasciitis and my primary care physician at the time said I could try injections or Kensio-Tape. Needless to say, I’m always willing to experience non-pharmaceutical and non-invasive techniques prior to availing myself to injections etc. After a week to 10 days the results were amazing, and the Plantar Fasciitis was resolved and has not returned. Working with national and international equine competitors from the hunter/ jumper circuit I always try to expand my skills by taking continuing education. The outcome of having effective tools helps my clients achieve their training and completive goals. Needless to say when researching who not only would provide the highest level of information in the field of Kinesiology Tapping but who was also a practitioner in their field I found Dr. Barbara. I thoroughly enjoyed the training I received from Dr. Barbara and without hesitation I have included Kensio- Tapping into my practice with amazing and consistent results! I highly recommend taking courses with Dr. Barbara." I just have to brag for a second about how amazing craniosacral therapy has been for my horses. I'm not gonna lie, I was a bit skeptical when I signed up for the course. Dr. Angelique Barbara is an excellent instructor who always answers emails promptly and thoroughly. I was very impressed with her level of knowledge, and how well she organized the Canine Myo-manipulative Functional Therapy Course. She cares a lot about her students and our canine companions! I would highly recommend any of her courses"
Completing the CST course was one of the best investments I have made in my profession. It gives one so much more to add to help horses. It also gave me more insight as to work with “difficult” (actually misunderstood horses). Sometimes what we have to offer is just not enough." 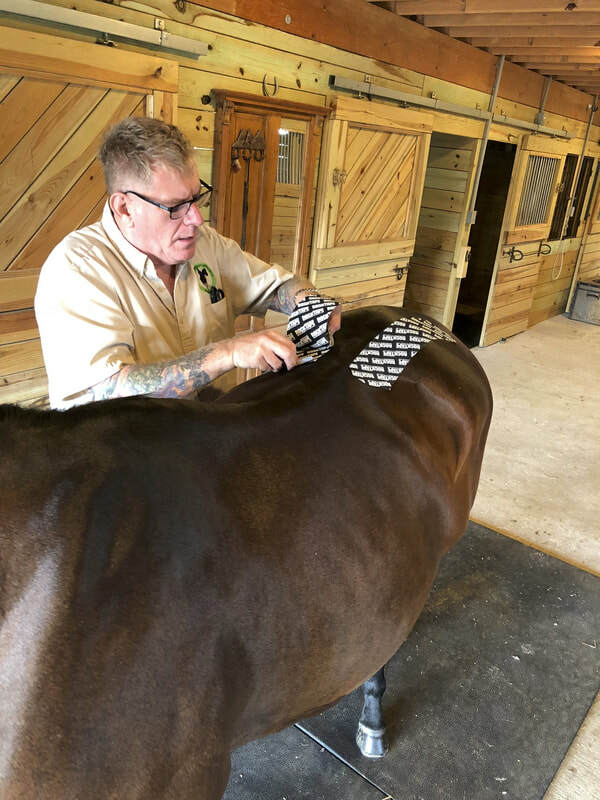 I studied at Guelph University for Equine Sciences (online) and I notice many of my school mates from all over the world have taken advantage of this awesome equine kinesiology taping learning! With summer coming and with it bringing my hired hands, I am registering my team one by one to take this course. 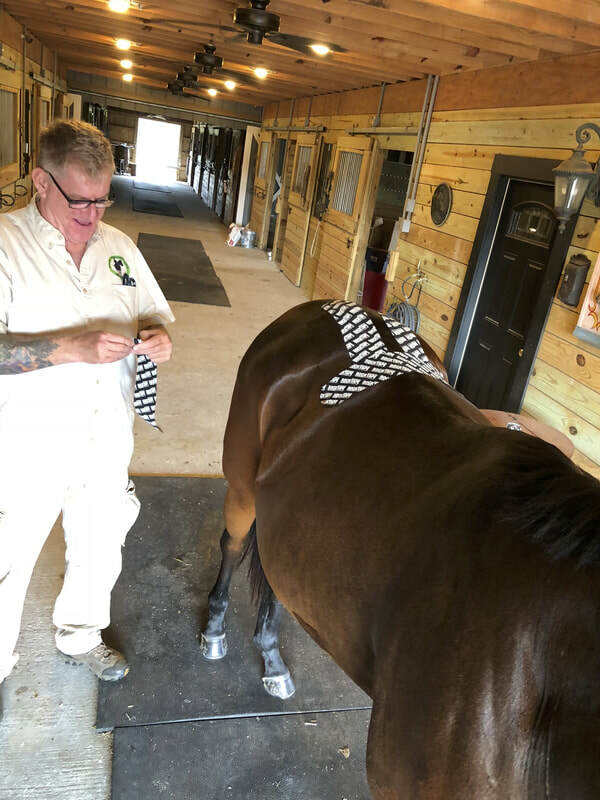 I was also very impressed with how much my Vet supports this equine kinesiology taping and encourages me to take as many courses as I can, so that is what we here at PrairieWind Productions intend to do. Of note, I used the equine kinesiology taping on a bad face scar, and after 7 days it is all but completely healed. I am a big believer and supporter of this course! This course is designed to make you succeed. I found it to be comprehensive, understandable, fun and most importantly, Dr. Barbara is right there to support you and responds to questions very quickly! I highly recommend this course!" 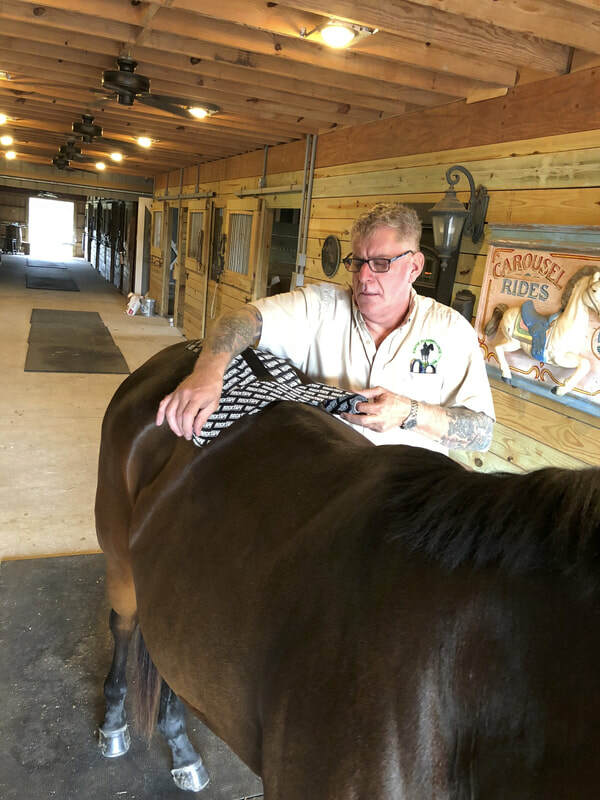 In 2016 I started an Equine Massage Therapy course with a different practitioner and I was really frustrated with the way the course was set-up. None of my questions got hardly ever answered and the material provided was very confusing. In 2017 I came across Dr. Barbara's webpage and I got in touch with her to find out more about her courses. Signing up with her was probably the best thing I have done. The courses provide so much information and I never had to wait longer than 24 hrs to receive an answer to my questions. I can only highly recommend Dr. Barbara's courses. 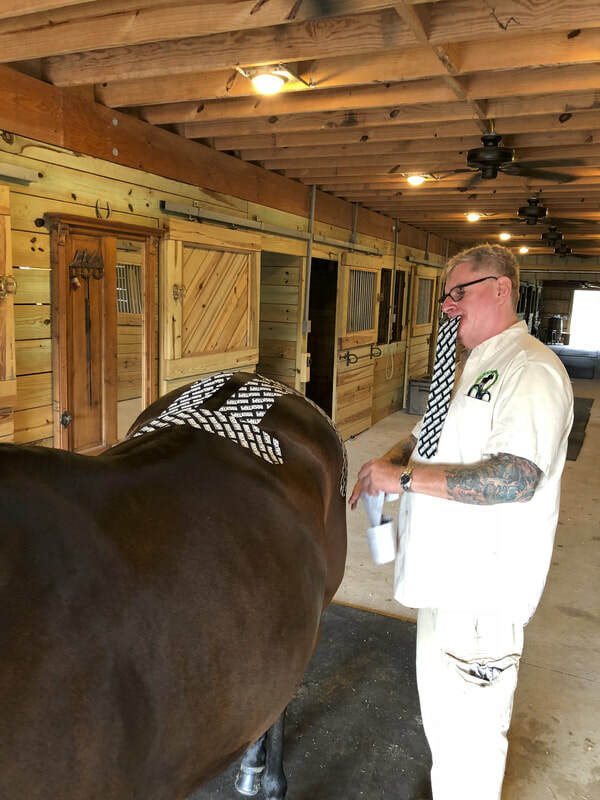 Meanwhile, I also finished my Equine Kinesiology Taping course and planning on taking the Equine Craniosacral course in the near future." The Equine Craniosacral course is an excellent course which is very detailed and set out so well making it easy to follow. This is a great therapy which achieves great results and I'm so happy to be able to now add this to my existing body work practice. Equine Craniosacral is a great treatment and course was very detailed making it easy to understand and do the work involved and treat horses. Excited for the next course and to have these great additions to my Equine Massage Therapies! I did the course to support dogs in my holistic practice even further with the kinesiotape and I really use it every day! I use it for the muscles and tendons, joints and back, but also for the acupressure points! It is a very complete course and got very good guidance from Angelique! Do not worry but just do it !! After 2 years I am still so glad I took your kinesiology taping course! Switching fields from equine to small animal I was not sure if I would have the opportunity to use my acquired skills... however working for the clinic I'm at now I've had many! We have a rehab portion and our clients love that we "go the extra mile" by taping after, it is especially helpful for those that are very weak after all the exercises/ water treadmill and/or experience weakness in the limbs. We have also used it for surgeries on suture lines to promote healing and lessen tension, and it's very helpful with our back patients as well. The most interesting and exciting thing is that it has worked out great for reptiles and exotics sometimes being the only thing that will stay on their body. I love how many uses I have found for it and I am finding more everyday! The best way to describe it is, it has become the perfect icing on a already good cake. It really shows clients that you are willing to do everything possible for their pet. It has been a really great addition to our practice! And Dr. Angelique Barbara DC Is the absolute best teacher!! ​The equine massage therapy course is great! I'm so happy with how available the teacher is and how easy it was to understand! Lots of studying but definitely worth it!! Can't wait to take the kinseology taping class next!!! Very Educational! I was amazed to see the amount of information available in the Equine Kinesiology Taping Online Course. The anatomy section is thorough. The meridian taping is a thoughtful bonus. I have been doing equine bodywork for a long time and even I had a "light bulb" moment. I highly recommend the courses! I would definitely recommend taking this course (equine kinesiology tape) to anyone and everyone with horse experience! I absolutely loved the whole thing and learned so much! My minis and I definitely thank Dr. Barbara for teaching me so much! AMAZING! Dr. Barbara is seriously the best instructor and I have used my training/certification more than I could have ever imagined. She is so helpful, always there for you and is a wealth of knowledge. I feel truly blessed to have met her and am continuing my education with her still today. Highly Recommend! Both courses (the equine kinesiology taping online course and workshop) were easy to follow and very informative! Support has been wonderful! Both these courses (canine kinesiology taping and ANMR) were fantastic and after using other techniques in my clinic for a number of years, ANMR has now become the primary method given how quick it is and the fantastic results it delivers. The courses are presented in a clear, easy to follow manner and the after support is outstanding.